The McMichael Room is named for the former mayor of Philadelphia and Union League President Morton McMichael. The McMichael Room, along with the Fell and Binney Rooms, was the original Library when the League opened the Broad Street building in 1865. The present decorating scheme of the room duplicates that of the 1885-86 period when decorative painter and League member George Herzog was commissioned by the House Committee to design and decorate the entire Broad Street building. Of note is the grand staircase leading up from the first floor to the McMichael, dating from 1865, it has been used by many dignitaries including 13 American Presidents. 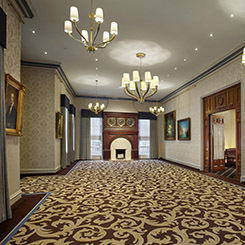 The McMichael Room was used as the Card and Chess Room until the 1980s when it was formally changed to private dining space.